I have been sentenced to 23 years in prison for possession with intent to distribute cocaine base. In 1992 while visiting a friend in Indianapolis Indiana, I was invited to a party given by Daniel Moore -- a bald, black guy that I'll never forget. We were drinking and visiting and suddenly the door was kicked open. Looming, screaming forms, wearing dark apparel screamed, "Get down, spread eagle on the floor!" We all spread out like blankets on the hard, wooden floor. An agent shouted, "We got it!!" I'm like, "got what?" and my heart turned cold. Now I know this wasn't good . . .
One hundred and four grams of cocaine base was found in a bedroom light fixture. Two hand guns were found underneath a pile of clothes (this being the bingo!). Nothing was found on any of the guests, so what did we have to fear? I was a visitor in someone's home, and no drugs were found on me. I didn't sell drugs to anyone and no one testified against me to say I had. In spite of all this, I was sentenced and convicted on two counts. Seven of the ten people in the house were all set free. 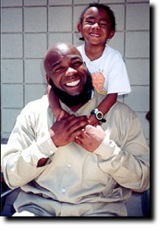 I have two sons, Brandan (8) and Jihaad (10) and I am trying to raise my children from inside of razor wire. I am trying to teach them the importance of education, the importance of family, the concept of working hard to achieve their goals and dreams, and to worship and love God. The picture of my little girl around my neck is my niece Courtney, she's five years old and wants to be a doctor. This was the very first time we met! This is my song: In here I sit with a very intune self, striving to liberate myself from the rule of tyrants. While being suffocated slowly due to some cruel government's plan, I must plow my fields and get them ready for the seed. Hoping for production, growth and development and that my two sons will not fall victim! Remember, the hope for the future is established upon one's own labor. Khalid Muhammad, "Prisoner of the drug war!